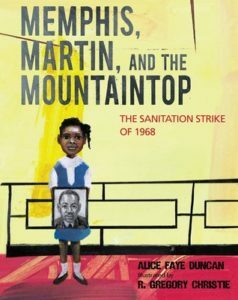 For a picture book, this is a very detailed view of the Sanitation Strike in Memphis in 1968 from the perpsective of a little girl named Lorraine Jackson. Her father worked picking up garbage at the time and she witnessed the turmoil caused by the death of two men he worked with. She marched with her parents and saw firsthand the cruelty, hatred, and inequality that existed and she saw some of those things change. Her heartfelt poem about Dr. Martin Luther King Jr. is featured toward the end of the book. What a difficult situation to live through! This is an eye opening book about a very uncomfortable time in our country’s history.